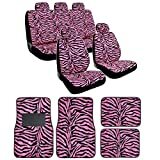 ZEBRA Animal Print Series Seat Covers by BDK are made from silky smooth velour with fine faux fur detail. Soft to the touch and comfortable for the rider. Fitted for standard seats and lined with foam padding for that extra cushion comfort. Protects your original car interior with “wild style”. Rubber tipped bottoms means these mats are slip-proof. NOTE: Seat covers not designed for vehicles with integrated seat belts (built into the seat) or attached armrests. Seat covers are not compatible with side air bags.